The Erechteion is one of the most elegant buildings of the Acropolis and it dominates the north side of the rock. The temple was built from 421 till 414 and from 409 till 406 BC on the place where, according to legend, Athena and Poseidon matched on the name of the town. On the photo you see the olive tree, Athena's gift to the town where as Poseidon gave the town a spring. The unknown architect of the Erechteion used the uneven rock to build an original temple in different parts on different levels. The temple was dedicated to Athena Polias and to Poseidon but also to gods of the mythical past of Athens like Erechteus. The monument was named after him. The Erechteion has three column galleries, one on the east, one on the north and another on the south side. The north galleryhas a monumental door and the famous Caryatids are at thesouth gallery also know as the Maidens porch. These six women statues are columns and in spite of their function, they are very elegant. They hold one leg bent whichbreaks the monotonous vertical axis of the column. The rich, deep folds of the almost transparent chiton (robe) give a feeling of diversity and balance. 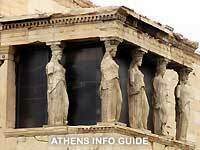 The six Caryatids on the monument are copies. 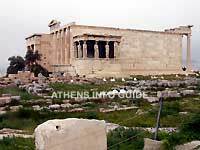 Five of the original are kept in the Acropolis museum. One was taken along with the Elgin marbles and a lot of other Greek important historical art, by Lord Elgin and is kept in the British Museum in London. For many years Greece and its people have urged the British government to give these artifacts back as they are part of the rich Greek history and belong to the Greek people. Read more on the "The Elgin Marbles" and the "Melina Mercouri" page. With its, almost feminine elegance, the Erechteion makes a vivid contrast to the imposing masculine dignity of the Doric Parthenon. The original form of this distinctive rectangular building is unknown since many parts were destroyed when it was converted to a Christian church in the 7th century AD. However, it is certain that the eastern porch of the building, with six slender Ionic pillars, each 6,8 meters (22,3 ft) tall, gave access to the Temple of Athena Polia. The last pillar on the right is now in the British Museum. In the main hall, the cella, of the temple there was a very ancient statue, made of olive wood, of the goddess Athena. This was the statue said not to be of human origin but to have been sent from heaven to honor the city of Cecrops. This also was the statue clothed in the Panathenaic celebrations with the peplos garment embroidered by the Arrhephores virgins.